We wonder what a “poorly accomplished predictable cheesy gay movie” looks like, and if that’s what you want in your life, well … That’s a shame. Sometimes the internet is hard. You know how on Facebook your great-aunt is always trying to catch up with you in the comments of a picture that’s buried all the way in the back of a photo album you never look at? Yeah, we’d imagine that’s kind of how this went down. Birdman, complete with the most ambiguous ending, is a film about the relationship between the creation and criticism of art. Certainly, this film is looking at a niche audience at best. Is it created only for critics by critics though, as Dustin would suggest? Surely not. It deals with some real issues, most notably about the fear of maintaining relevance, especially to the people around you. Riggan (Michael Keaton) is really struggling with his second act in life, desperately wanting people to take him seriously in a new venture as a playwright. Our reviewer must know what that feels like, since his only discourse to grab attention in his “review” was to capitalize what he thought was the sum total of his thoughts at the end, maybe making sure to stress that, you know, he didn’t quite care for this picture. Subtlety must not be his thing. While there’s absolutely nothing funny about the subject matter of 12 Years a Slave, this review is unintentionally hilarious and kind of sad. First off, we have a ton of questions. Did Robert show this to his children? How much did they watch as a family? Were they disappointed when it wasn’t a comedic romp or a hopeful love story? Are they familiar with the MPAA? Folks, ratings are there for a reason, but they can only do so much. Secondly, we can understand the problem with over-the-top violence. But “overdone” decadence? It’s set in the South, during the darkest period in America’s history. There are moments of antebellum-style royalty, but it’s not indulgent or excessive for the time period. Thirdly, an agenda? Please. A silent film winning Best Picture in 2011? Who would’ve guessed? Apparently not this reviewer, who watched The Artist at what must have been the most miserable girls night ever. The Jack Russell was definitely an immensely charming aspect of this film, but to say that he was the only one that “could act” is a preposterous statement, on several grounds. It’s incredibly hard to make a silent picture, especially these days when such things are a sacred cow. And to have a cast, crew and production studio commit to such an undertaking is impressive in and of itself. And then we get a gem like this? C’mon Mary, we’ll take your copy. But seriously, we haven’t added this to our collections yet. So can we have it? Ok, so this is weird, right? Turning an inspirational story of overcoming fear and adding a little humanity to royalty, The King’s Speech is lovely. So for this reviewer to claim a propaganda conspiracy for the Royal Wedding seems a bit far-fetched, and a little paranoid. There’s plenty of darkness to be found in the world, so why can’t we have a quiet, lovely little film about King George VI’s stutter? And honestly, we were all going to watch the Royal Wedding anyways. It’s elegant, fabulous and we can’t help it. Ah, the English language … She is a cruel mistress, betraying us at every turn. Evidently, Steven made her mad, if he even had a grasp on her in the first place. Between “wore” as worst, “dumn” and “plane out," it’s amazing this guy was able to string together a couple of sentences. Honestly, we should be impressed. No Country for Old Men is classic Coen Brothers in just about every way. Shocking, cold violence, strong, poignant dialogue and an ending that perplexes some and angers others. Of course not everyone is going to be thrilled by this film. But it’s hard to argue that there isn’t a compelling story on the consequences of violence, aging and the passing of time that renders a poignant statement on how one generation gives way to the next. But this reviewer is having none of that bull, instead focusing on the violent aspects of this film, which was a common theme in the thread of reviews. Which, sure, we get it. It’s often gut-wrenching, but intentional. Yet this guy does, however, set himself apart by listing all of the guns that were used, noting that “gun nuts, sorry, gun aficionados” would be interested in such a comprehensive list ... which is odd. His biggest gripe about No Country for Old Men? “For the most part, when it comes to portraying anything close to real life, Hollywood really does a bad job of it and this film proves it.” It’s too bad that Hollywood couldn’t provide him the “happy” ending he needed. “Unworldly.” Such an interesting word. Oddly enough, unrelatability was something that Russell Crowe’s John Nash struggled with in A Beautiful Mind. Maybe this person is projecting, which happens to be another sort of thing John Nash struggled with. Someone is decidedly not entertained. Honestly, we don’t really love the condescending tone that this review takes on when discussing those that might love this film. He takes a “holier than thou” stance on issues that the film does not even argue a case for, particularly the assault on Maximus’ wife. Clearly, the Emperor says this to get a reaction, because he’s a sociopath. No one is wallowing here. Gladiator is great, Ridley Scott is great and Russell Crowe is great. One of the last great historical epics, this is a near-perfect revenge story with clear, intentional motivations for the characters. And that dialogue? Pitch-perfect. And, in the specific example provided, while it may have been a stretch for Maximus to escape (it looks like a blocking issue more than anything), it’s freaking Maximus Decimus Meridius. Well, nothing gets by this guy. Honestly, it could be worse … At least he knew it was going to happen. But was the actual sinking of the ship not compelling enough for you? The sequence where Rose went to rescue Jack from the submerged cabin is chilling for its silence alone, where all the audience hears is the lapping of water on the walls. Sure, Titanic is a little long, but it’s a sweeping epic of sorts that pairs all the best parts of James Cameron with all the cheesy parts of James Cameron. And what’s not to love about that? Besides, who doesn’t enjoy a good debate on whether Jack could’ve fit on the door with Rose? He totally could, by the way. She broke his frozen hands and our hearts in the same motion. Who hurt you? Forrest Gump is arguably the most “American classic” in this grouping of films, and is widely regarded as, well, just delightful. Sure, it messes with history and really manipulates the heart strings in a ton of ways. But retarded? Is that necessary? For starters, it’s Tom Hanks, America’s true sweetheart (sorry, Julia Roberts), completely losing himself in a great character. It’s a pretty simple film, but incredibly heartwarming. And when we realize why he’s been sitting on that bench this whole time, trying to go see Jen-nay, only to find that he’s a father? Man … we defy you to not to weep. His realization that he’s a father, coupled with the confirmation that he understands his disability is a one-two gut-punch. “Is he smart? Or is he … ” Okay, who’s cutting onions? This one really hurts. Can we dumb down the atrocities and horrors of one of the darkest eras for humanity so that children can see it? In fact, can we make it animated? Actually … Maybe not a terrible idea, but not for the reasons listed here. It’s funny to think that in a horror film about the psyche of serial killer/cannibal, the most horrific thing to this guy is the idea of a woman as an FBI agent. Also, take a look at when the esteemed gentleman posted this review. Yeah, June 2016. So, this is a good review? Again, the internet is tough to operate some times. This. This is just golden. This is the reason to come to Amazon for your one-star reviews of great movies. First off, the dude watched Rain Man on TV and liked it so much that he wanted to see it again. He bought the Special Edition and was shocked, appalled and flabbergasted to find that this R-rated film was filled with “gutter language,” and then blames it on the Special Edition of the DVD that he bought, as if editing for TV wasn’t a thing. So simple and so great. Kids these days, amirite? They want nothing but explosions, fast cars and “bloody ninja sword fights.” In fact, this person has a point. Can we take all of these historical period pieces and just put in a reel of bloody ninja sword fights? Then we can really see how Gandhi led his peaceful revolution: ninjas and the Iron Gauntlet of Fear. He certainly has his reasons, and many of them at that. Annie Hall is probably the quintessential Woody Allen film, and is really experimental in the way it tells the story of Alvy Singer. So it’s kind of funny that this is true introduction to Allen’s filmography, outside of Antz. He lists all of his problems that he had with the film, basically saying that he probably wouldn’t enjoy anything, which is all very fine. He’s certainly more than entitled, and he certainly knows this. But he ends his review by saying, “Boo.” And that, we simply cannot forgive. “Trying.” Rocky is vital and made Stallone a star. Sure, he looks part-man, part-machine these days, but this was pure unadulterated Sly, at the peak of his game. He then turned a little Best Picture film into a badass American saga. There is no “trying” here, only carving an American classic right before your more than likely Communist eyes. Well, no … But what if Pure Flix remade The Godfather into an uplifting drama where a student's peers and professors berate him for believing in the Godfather? And then at the end, in a beam of beam of white light, Vito Corleone appears, coming to change the hearts and save the souls of the non-believers. Can we mo-cap Marlon Brando into the remake? 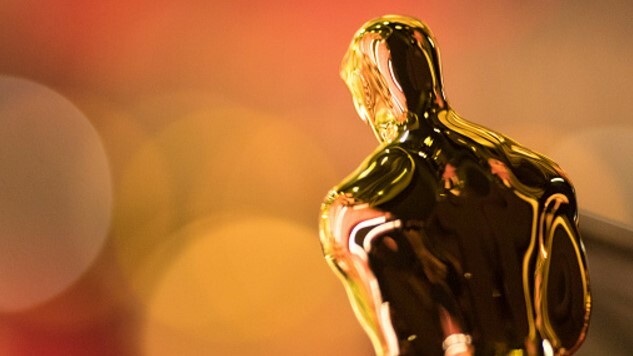 Every year, the Academy of Motion Picture Arts and Sciences chooses one film to be recognized above the rest as Best Picture, the most prestigious award that one film can win. It holds a lot of weight. Much of the time, the recipient of Best Picture is widely regarded as deserving, the one film of the year that stood out from the rest as sensational, groundbreaking and important. Well, that’s the idea anyway. Honestly, it’s an overly long and dramatic ritual that sometimes ends in disaster. Because it’s only Thursday, and we’re still reeling from what happened at the Oscars on Sunday night, we think it’s best to take an alternative look at Best Picture winners, currently and from years past. There can be a lot of disparity between critics and audiences as to what’s good and what isn’t. And really, when it comes to individual tastes, there are so many … individuals … out there. In the immortal words of a Grinched-up Jim Carrey, one’s man toxic sludge is another man’s potpourri, after all. But let’s be honest—some opinions can be bad. Some toxic sludge is, really, just that. Need proof? Look no further than Amazon reviews to find that a lot of people really hate good movies. Really, really hate them. So in light of all these things, here are 20 of the very best one-star Amazon reviews for Best Picture winners. Ideally you’ll laugh, cry and become a better person. Otherwise, you can direct that energy into your very own gallery. Have fun and learn something about yourself. Pete Mercer writes for Paste and is a self-professed movie snob who would love to argue with you about your bad opinions. Follow him to see him talk about himself, like literally, all the time.